Note: This month, the Three will be sharing our foodie wish lists for this holiday season. Just in case, Santa is reading. Enjoy. I would love to have a new set of knives, a non-stick wok or a six-burner stove. But as I get older, my foodie interests are beginning to shift from knick-knacks to those things that are less quantifiable, such as experiences that fill a life with a little bit of knowledge, pleasure and a sense of well-being. Those intangibles aren’t so easily gift-wrapped and sold at store. I’ve been to Hong Kong more than couple of times. But with every succeeding trip, I always leave with a sense that my understanding of this former British colony is much too touristy. In some ways, it has almost become routine and even mundane. There must be more? I know there is more. My first wish is to immerse myself in Hong Kong’s culinary life. I want to bite into dim sum at the Dynasty Restaurant or slurp my beef noodles at Lok Yuen. I would love to dine in private kitchens like Yin Yang, Magnolia or Yellow Door. I want to indulge in the tasting menus of Joel Robuchon and Nobu Matsuhisa and explore the narrow market alleyways of Sheung Wan. Most of all, I long to learn from “ the Julia Child of Hong Kong” Cecilia Au-Yang at the Chopstick Cooking Centre. In the end, I would like to gain a greater sense of this widow display of China. In my mind, there is no better way to understand Hong Kong than living their food experience from the ground up. What can I possible say about Chef Ferran Adria that has not been already written? He has been called many things from an innovator to anarchist, from culinary genius to gastronomical clown. However, one thing cannot be denied. Because of his groundbreaking techniques and deconstructive approach to food, the dining experience as we know it will never been the same. My second wish is simple and difficult at the same time: to eat a meal at El Bulli. Eating the 30-course tasting menu at Chef Adria’s restaurant along the Catalan Mediterranean would be foodie equivalent of visiting the Vatican. It is a gastronomical experience that may have few equals. I have read the stories. I have seen the photographs. I have even salivated over his books. But alas, this wish may have to stay a dream for a while longer. Believe it or not, El Bulli is booked solid for next year’s season and the waiting list is very, very long. PS. Just I little follow-up wish. I love Kylie Kwong. In my opinion, she is the Jamie Oliver of Chinese cuisine. I would love to meet to her or at the very least, eat at her restaurant. But for now, that wish can wait some other time. Many thanks to Erik Lacson for the lovely photograph. Hi Franco. 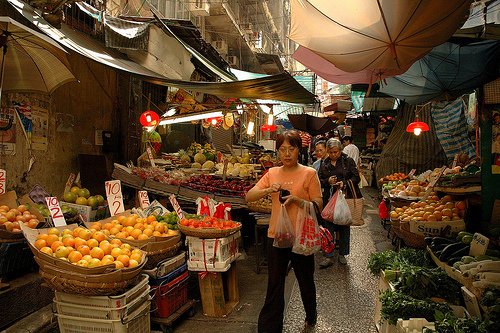 I walk by the markets of Sheung Wan and Central almost daily on my way to work. There is something about HK street markets that fascinate me. The vivid leafy greens, the unidentifiable roots and herbs, the smell of dried seafood in weird shapes. The haggling in Cantonese. The large trucks trying to squeeze into narrow lanes and not run over anyone's feet. I agree with you that to immerse oneself in HK's culinary culture is to traverse its markets, to visit its fishing ports like Aberdeen, to visit far off places in outlying islands/territories for Anthony Bourdain's favorite roasted meats, or a pigeon you have to trek to eat. And I also want to enroll in Chopsticks and this other place called Martha Sherpa where they offer a 6 hour lesson on Cantonese cooking, complete with market visit! Oh, I've tried Yellow Door for a la carte lunch and was very happy. Still have to go for their 14-course dinner. :) I think the private kitchens here are as much about the food as it is the personalities behind them. It's an understatement to say they are passionate about food and wine. I adore Hong Kong. If my Winter Break from school was longer (and I wasn't going to India), I would have made time for a quick visit. Franco, it took Adam of Amateur Gourmet four years of emailing in his request for a reservation to get one to El Bulli, patience and persistence is the only way to go I think. I love HK and its food; even after living there for two years, I would love to spend more time tasting its culinary delights. My foodie xmas wishes include a few months in Japan too, there are so many interesting treats to try there. By the way, just read your blog. I enjoyed the read. Thank you for sharing your experience and thoughts. Thanks and glad you enjoy reading my blog.